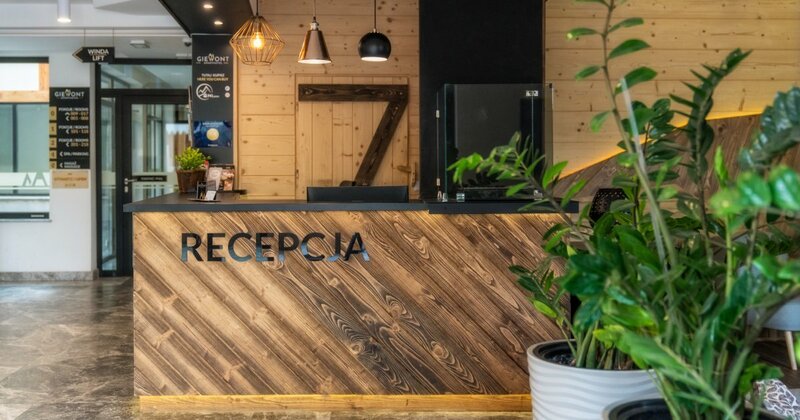 A 4-person or 6-person two-bedroom apartment in the very center of Zakopane, 50m from Krupówki. The apartment consists of several rooms such as a living room with a kitchenette, two bedrooms, bathroom and two balconies. The first steps will lead you to the area of Morskie Oko. Here, we can leave our luggage in a wall-size wardrobe. The living room includes a full kitchen equipment for 6 people. Table and chairs, cutlery, dishes, glasses, mugs, wine glasses, pots, refrigerator, dishwasher, cooking utensils, electric kettle, microwave oven, induction hob will allow you to prepare your own meals. The sitting area offers a corner sofa bed for two, a coffee table and a flat-screen TV. Two bedrooms are equipped with large double beds, bedside tables, wardrobes and flat-screen TV sets. One of bedrooms includes a work corner. The balconies, accessed from the living room and one of the bedrooms, have been equipped with a set of furniture to let you enjoy the views of the Tatras. We may see the Sleeping Knight known as Giewont, Sarnia Skała leading to Polana Strążyska. In the background, in good weather conditions, you will see the Western Tatras (Kopa Kondracka, Krzesanica, Małołączniak, Ciemniak). The Bathroom includes a shower cabin with a shower head, toilet, wash basin and hairdryer. The apartment is also equipped with a set of towels and toiletries, an ironing board and an iron - available at the reception. The apartment offer does not include own food service, however, it is possible to order a catering breakfast served to bed at a specified time (orders accepted until 18:00 the day before).